"Better late than never" has become my motto recently! While I wasn't one of those people who thinks a baby would just fit right into our household without any disruption, I have been amazed at how quickly time passes now. The hours and days are just flying by and Oscar is now 5 weeks old. At the end of each day if he is fed, clean and happy and I have had a shower and 2 decent meals then I call that a total success! Which brings me on to my first Daring Cooks challenge which I was really excited about. While I love to bake (and eat what I've or anyone else has baked) I think I am more of a cook. It is what I do everyday and nothing makes me happier than feeding my family. I actually managed to complete the challenge before the posting date, but then promptly forgot to post it, or anything else for that matter. (These were incredibly difficult to photograph) Amazingly for a cheese freak like myself this was a little too ... cheesy. And definitely rich! I think part of my ambivilence comes down to simply being so tired that day that I couldn't think straight (this was my first time in the kitchen post baby and probably should've gone with something I had made before). I had absolutely no problems making these though. The texture was perfect, they cooked well and didn't fall apart despite my very rough shaping job. Hubby wasn't keen on the texture. He loves gnocchi but of the potato and flour variety where there is a little bite to each piece. I would make these again though, perhaps with lemon rather than sage to cut through the richness. All in all a great first challenge! Preparing the ricotta. 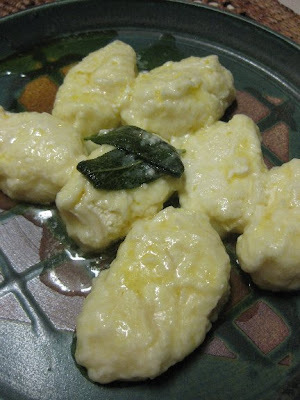 If the ricotta is too wet, your gnocchi will not form properly. In her cookbook, Judy Rodgers recommends checking the ricotta’s wetness. To test the ricotta, take a teaspoon or so and place it on a paper towel. If you notice a very large ring of dampness forming around the ricotta after a minute or so, then the ricotta is too wet. To remove some of the moisture, line a sieve with cheesecloth or paper towels and place the ricotta in the sieve. Cover it and let it drain for at least 8 hours and up to 24 hours in the refrigerator. Alternatively, you can wrap the ricotta carefully in cheesecloth (2 layers) and suspend it in your refrigerator for 8 to 24 hours with a bowl underneath to catch the water that’s released. Either way, it’s recommended that you do this step the day before you plan on making the gnocchi. Making the gnocchi dough. To make great gnocchi, the ricotta has to be fairly smooth. Place the drained ricotta in a large bowl and mash it as best as you can with a rubber spatula or a large spoon (it’s best to use a utensil with some flexibility here). As you mash the ricotta, if you noticed that you can still see curds, then press the ricotta through a strainer to smooth it out as much as possible. Add the lightly beaten eggs to the mashed ricotta. Melt the tablespoon of butter. As it melts, add in the sage if you’re using it. If not, just melt the butter and add it to the ricotta mixture. Add in any flavouring that you’re using (i.e., nutmeg, lemon zest, etc.). If you’re not using any particular flavouring, that’s fine. Add the Parmigiano-Reggiano and the salt. In a large, shallow baking dish or on a sheet pan, make a bed of all-purpose flour that’s ½ an inch deep. With a spatula, scrape the ricotta mixture away from the sides of the bowl and form a large mass in the centre of your bowl. Using a tablespoon, scoop up about 2 to 3 teaspoons of batter and then holding the spoon at an angle, use your finger tip to gently push the ball of dough from the spoon into the bed of flour. At this point you can either shake the dish or pan gently to ensure that the flour covers the gnocchi or use your fingers to very gently dust the gnocchi with flour. Gently pick up the gnocchi and cradle it in your hand rolling it to form it in an oval as best as you can, at no point should you squeeze it. What you’re looking for is an oval lump of sorts that’s dusted in flour and plump. Gently place your gnocchi in the simmering water. It will sink and then bob to the top. From the time that it bobs to the surface, you want to cook the gnocchi until it’s just firm. This could take 3 to 5 minutes. 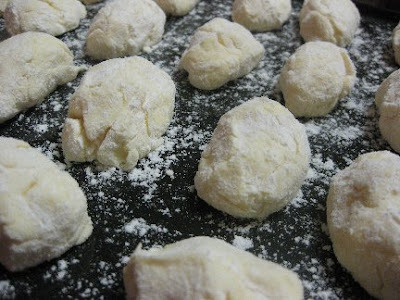 If your gnocchi begins to fall apart, this means that the ricotta cheese was probably still too wet. You can remedy this by beating a teaspoon of egg white into your gnocchi batter. If your gnocchi batter was fluffy but the sample comes out heavy, add a teaspoon of beaten egg to the batter and beat that in. Test a second gnocchi to ensure success. Form the rest of your gnocchi. You can put 4 to 6 gnocchi in the bed of flour at a time. But don’t overcrowd your bed of flour or you may damage your gnocchi as you coat them. Have a sheet pan ready to rest the formed gnocchi on. Line the sheet pan with wax or parchment paper and dust it with flour. You can cook the gnocchi right away, however, Judy Rodgers recommends storing them in the refrigerator for an hour prior to cooking to allow them to firm up. Have a large skillet ready to go. Place the butter and water for the sauce in the skillet and set aside. In the largest pan or pot that you have (make sure it’s wide), bring at least 2 quarts of water to a boil (you can use as much as 3 quarts of water if your pot permits). You need a wide pot or pan so that your gnocchi won’t bump into each other and damage each other. Once the water is boiling, salt it generously. Drop the gnocchi into the water one by one. 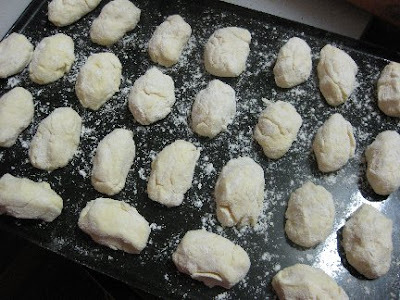 Once they float to the top, cook them for 3 to 5 minutes (as in the case with the test gnocchi). When the gnocchi float to the top, you can start your sauce while you wait for them to finish cooking. Place the skillet over medium heat and melt the butter. Swirl it gently a few times as it melts. As soon as it melts and is incorporated with the water, turn off the heat. Your gnocchi should be cooked by now. With a slotted spoon, remove the gnocchi from the boiling water and gently drop into the butter sauce. Carefully roll in the sauce until coated. Serve immediately. Looks awesome! Thanks for the tip about making sure the ricotta is not too wet. Looks great Susan - I have never made gnocchi before, but I have certainly tried it and it is rich. They look great! So even though I totally agree that the gnocchi were impossible to photograph, you managed to do a pretty good job. I made some with lemon and it definitely helped to cut some of the richness. Also, scrolling down I saw your cheesecake looks YUM, it's also a great idea, I wouldn't have thought to combine apples and cheesecake. Was it as good as it looks?